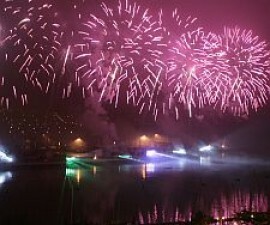 Portugal has a rich cultural past that is evident in its language, architecture, food and in its art, crafts and cultural activities. 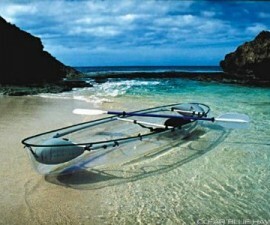 Shopping for unusual or unique pieces to take home as to remind you of your trip or as gifts for friends and family is one of the delights of visiting the Algarve. 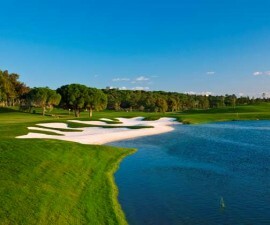 Faro and the surrounding area provide ample possibilities for hunting out fun and interesting crafts and works of art in a variety of locations. There are many arts and crafts that are popular all over Portugal including embroidery, lacemaking, weaving, painting, children’s art and woodwork as well as ceramics and mosaic work for which the region is particularly famed. Many travellers limit their shopping time in Faro to the main boutiques and mall areas but there is plenty more to see besides. By all means make a start on the streets around the Rua de Santo Antonio, Rua de Francisco Gomes, Rua de Portugal, Rua dos Letes and the Galerias Faro for some quirky independent boutiques and check out the Forum Algarve towards Faro Airport for some high street names and designer boutiques at reasonable prices, but the real fun is to be had at the many markets dotted throughout the area. For a glimpse of the past and a piece the present day Portuguese culture however, be sure to head to the market. 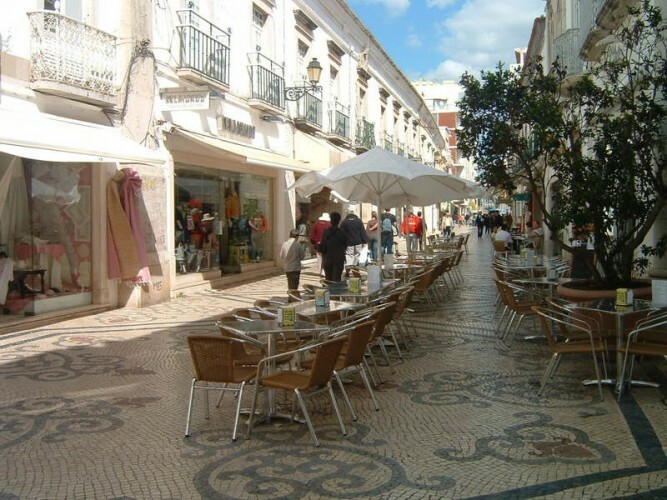 Located right in the heart of Faro, the city centre market is open daily and sells pretty much everything from clothing and household goods to unusual foods and handicrafts. There is a special exchange market on the first Sunday of the month, known as TrocAqui, at which traders and individuals are invited to swap and trade their goods between 10am and 1pm.The streets leading away from Mauel Bivar gardens make a good place for a leisurely stroll among the boutiques, stopping every now and then for a coffee or tasty snack and a chance to watch the world go by at one of the pavement café tables. Take a detour to the Mercado Municipal on Largo Dr Francisco Sa Carneiro for a delightful assault on the senses, where stall after stall is loaded with fresh produce including cold meats, cheese, baked goods and fresh fruit and vegetables embracing every colour of the spectrum. Prices here are incredibly cheap and it is worth taking the time to stock up on a few tasty snacks to see you through your sightseeing. 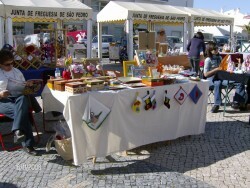 Faro’s Municipal Theatre is the location for the Producers, Crafts and Collectables market on the third Sunday of the month from 10am to 6pm, providing a colourful spectacle. 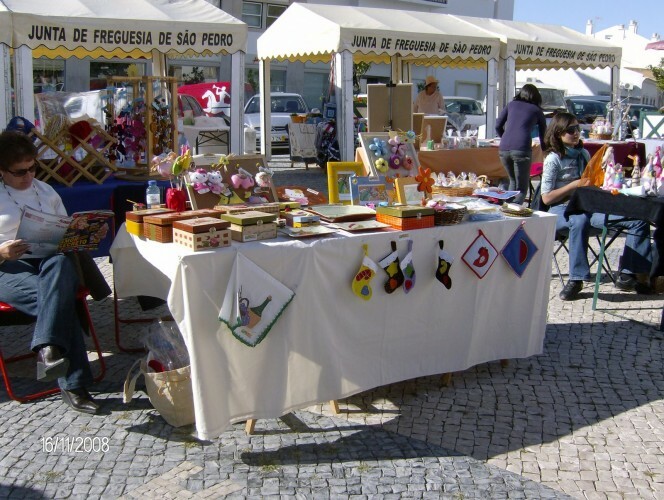 There are several gipsy markets that take place along the length of the Algarve throughout the month including at Estoi on the second Sunday. Here, as well as at Santa Bárbara de Nexe, the local women can still be observed weaving and plaiting palm leaves to make baskets, hats and mats for sale to domestic households and tourists. Estoi is situated just eleven kilometres from town and is the site of some of the area’s famous Roman ruins, making it doubly worthwhile to make the trip. Several flea markets take place within the vicinity – at Almancil on the second and fifth Sunday, next to the campsite at Fuzeta on the first Sunday and at Quelfes on the fourth and fifth Sunday. Meanwhile general markets are also held at Almancil on the first and fourth Sunday, at in front of the Convento de St. Antonio Loulé every Saturday morning, at Fonte Sante in Quarteira every Wednesday, in Fuzeta on the first Thursday and next to Rua das Olarias at Moncarapacho on the first Sunday. Traditional clothing and local wines are popular wares for sale in the markets and at a number of independent boutiques, as are basketware and embroidery. Traditional custom was to embroider a handkerchief for a loved one and this custom still lives on today, extending to unique, hand-embroidered linen as well as bags, purses and other novelty items. Visitors will note the strong ceramics tradition in Portugal and there is plenty in and around Faro. Tiles decorated with traditional motifs are enduringly popular, as are more modern interpretations that push the boundaries of the traditional approaches. 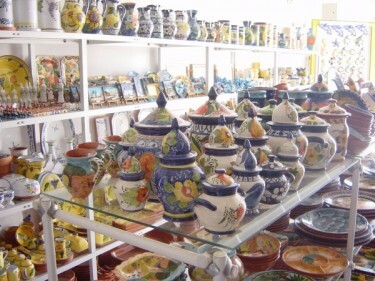 Rustic earthenware, hand-blown glass, hand-made jewellery and traditional hand-made candles complete the wide variety of crafts on offer for you to treat a loved on or simply to ensure that you have enduring memories of your trip to Faro in Portugal.